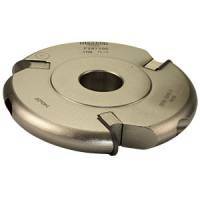 This bearing guided two flute dovetail cutter has been designed for the production of tapered sliding dovetail joints. The cutter was primarily designed for the production of the traditional tapered sliding dovetail joint in guitar making. This strong and time tested connection of neck and body on an acoustic steel string guitar allows for a very slim, aesthetic neckheel. The cutter's 1:1 geometry eliminates the guesswork and necessary calculation of offsets when making templates. Since the diameter of the ball bearing is equal to the middle diameter of the cutter, the template guide line is the same for routing both the tenon and the mortise. The resulting joint should be a perfect fit. Although primarily designed for guitar making, this form of joint has many other applications in furniture making and joinery. Important: To allow the ball bearing to follow the entire template shape, the narrowest width of the tapered template must be at least 20mm (i.e larger than the bearing). The depth of the cut for the dovetail and housing must be 13mm.